Visit Clay Pit Ponds This Summer! Clay Pit Ponds State Park Preserve is a 260-acre natural area near the southwest shore of Staten Island. Once the site of clay-mining, the Preserve contains a variety of unique habitats such as wetlands, fields, sandy barrens, spring-fed streams and woodlands. As a terminal point for some northern and southern species, this area is rich with plant and animal life. Clay Pit Ponds is New York City’s first State Park Preserve. It is managed to retain the unique ecology of the area. The Preserve is an Audubon Bird Conservation Area and is home to the historic Gericke Farm. 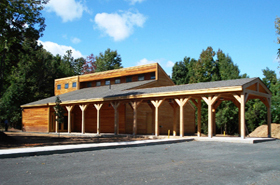 The Interpretive Center at Clay Pit Ponds State Park Preserve strives to provide educational and recreational programs for people of all ages. The Interpretive Center also offers in-house and outreach programs for schools, summer camps, and other groups throughout the year. These programs are designed to fit your curriculum needs and to enhance your visit to our state parks. All programs are FREE of charge unless otherwise noted. Children must be accompanied by an adult. Check out the schedule of Summer Programs! Enjoy hiking on our designated foot trails. Bring your own horse and ride our 5 miles of horse trails. All trails are open from dawn until dusk. Wildlife has free run of the Preserve. This is their home and you are their guests. Visitors must please follow Preserve rules. The Interpretive Center at Clay Pit Ponds is now open to the public. This fully accessible building features interpretive displays of the history of the park and of its natural elements. The park’s educational and community programs will take place in the interpretive center located at 2351 Veteran’s Road West Staten Island, NY 10309 Phone: (718) 605-3970 or visit their website.